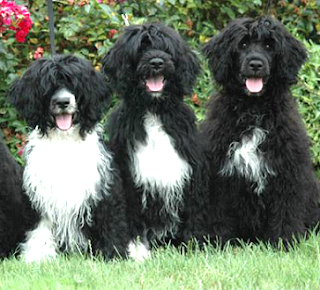 The Portuguese water dog is also known as the water dog. This breed of dogs was used by Portuguese Fishermen for centuries while catching fish and doing other duties on ship for instance they were a good messenger for ship men, they are happy to be in water and are known for their good swimming abilities. This dog breed is really intelligent and loyal, they are energetic and love to play in water and to do jobs in and around water. They are also a good watchdog because of their alert nature, they can alert their master about any stranger. This is a very fun loving breed and do well in and around a family. Early socialization is mandatory as they are a good family breeds so it will be nice to train them to live in homely setting. This breed of dogs likes the company of others they are good with other pets and small animals. Portuguese Water Dog breed has a single coat short curly and thick this breed's coat is weather resistance so bathing will not effect them. they are good learner and do well if treated with guidance and firmness they will not respond to any hard and harsh methods of training. This dog breed does well in family environment and are equally suited both as indoor and outdoor dogs. They need regular brushing to avoid dead hair, they have a very thick and close knit coat which can easily get matted so it is require to clean their coat on regular basis. bathing should be done when required, there is no harm in regular bathing for this dog breed. Some lines of this dog breed are prone to hip dysplasia and PRA. They are also prone to GM-1 Storage Disease, a fatal nerve disease. The average lifespan of this dog breed is about 10-14 years.